The Style Guide has been wonderfully received so far - at the launch events in London and New York, but also online and through personal messages. Thank you all. There are a few things I realise I haven't emphasised so far. One is that we proudly designed and printed the book in London. This necessarily adds to the cost, and it's something no big publishers do anymore, but it gives us greater control and access to more interesting design options. An example is the binding. Known as 'otter binding', it opens along the spine, allowing the book to sit flatter on the table. Useful when you want to display that particularly inspiring image. We also changed the paper following feedback on the first Permanent Style publication. Although still matte in finish, it is not as soft, allowing for crisper images and detail. Small things, but then that's what it's all about. The Style Guide is available to buy in the Permanent Style shop and over 30 specialist stockists worldwide. The Style Guide was supported by four of our favourite brands: Anderson & Sheppard, Begg & Co, Edward Green and Vitale Barberis Canonico. We thanked them by putting together a photo-shoot that is included in the back of the book. Here I wore my clothes from the brands, and Jamie and I constructed looks that have the same practical aim as the rest of the book - explaining why things work and when they don't. Below are three examples from that shoot. Anderson & Sheppard's unique take on the shawl-collar cardigan, cut shorter and narrower, makes it dressier than most styles. 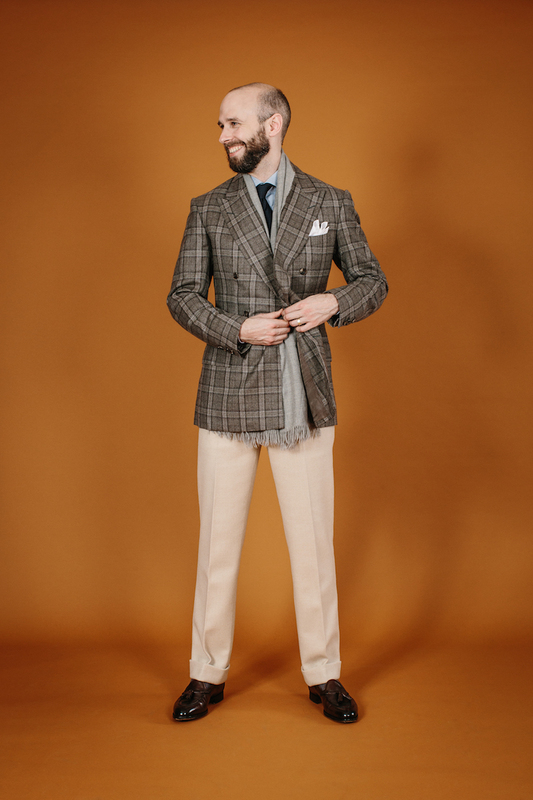 A small scarf is worn at the neck, in natural-coloured cashmere that plays well with the brown cotton trousers. 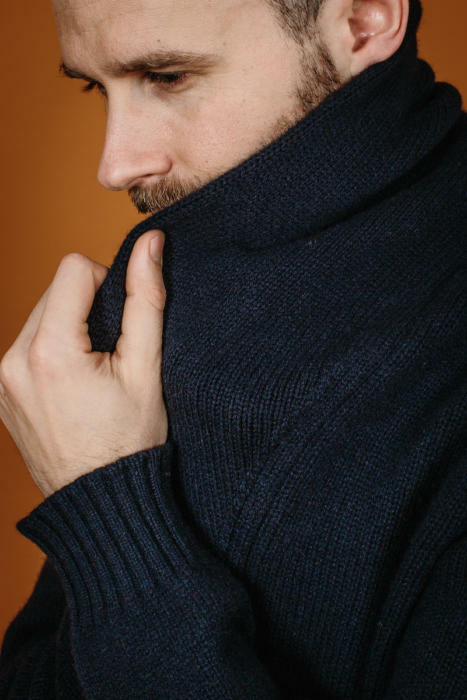 Permanent Style ‘Wispy’ dark-natural cashmere scarf: Begg & Co.
Shawl-collar navy lambswool cardigan: Anderson & Sheppard. Mid-grey cashmere crew neck sweater: Anderson & Sheppard. Fawn cotton trousers: Marco Cerrato bespoke. There is little consistency among colour terms, but the flannel of this suit is definitely not navy, yet remains dark enough to be formal and smart. That makes a good foil for other blues – here a navy roll-neck, pale-blue cotton handkerchief and metallic lightweight scarf from Begg. For a brown shoe to work here, it has to be both dark and muted. Edward Green calls this colour ‘bronze’. There’s a reason so many well-dressed men used to wear cream trousers: they go with everything. 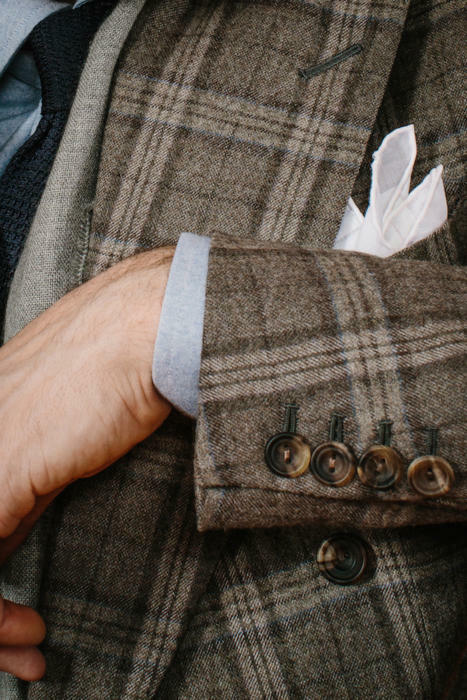 Here they are a great balance to the boldly checked jacket, which is further restrained by a simple blue shirt, navy tie, white hank and grey (washed) scarf. Shiny shiny brown loafers, reflecting the brown elsewhere in check and jacket buttons. You can follow the discussion on Style Guide – the partners shoot by entering your email address in the box below. You will then receive an email every time a new comment is added. These will also contain a link to a page where you can stop the alerts, and remove all of your related data from the site. I especially like the first, casual, outfit and often wear similar pieces. 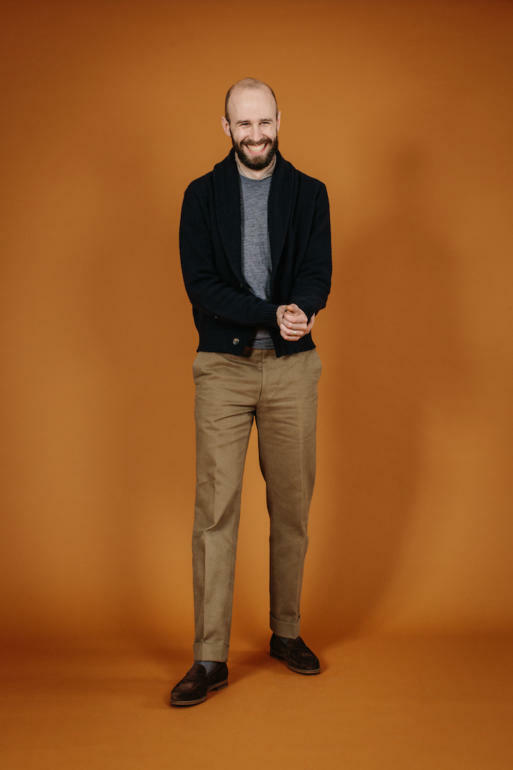 When do you think that more formally cut trousers, crease/cuff/side tabs/comparatively higher rise/ become in appropriate in casual wear, and you have to swap to incotex etc? As in what outfits, sneakers even? If you are positioning as a style guru, why the dreadful fashion affectations? Wearing a scarf under an odd jacket is just a fashion. Isn’t your idea to not go fashion? I don’t think any of these things are fashion affectations, least of all wearing a scarf under an odd jacket. It’s highly practical as well as looking good. This post may eventually offer an opportunity to ask you a question that has been in my mind for quite some time. How many levels of formality could your own wardrobe be featured as displaying? And more specifically, which ones do you have in mind when writing your posts? I’ve come to think that any blogger writing consistently on menswear ends up assuming a set of levels worth considering. In order to make such an exercise easier, let’s take shoes as a reference point from which such an ordering could start, while assuming that the two extrem ends in the then workable spectrum were trainers and pumps. I hope that makes sense to you. I think the notion of items’ versatility you have touched upon on many occasions could then be easily related to such a hierarchy. For sure this kind of ordering would be not only subjective but also dependent on many factors. However it could be very instructive. That’s a very interesting point John, let me think about it. There will obviously always be variability around the spectrum, but I think you could usefully isolate four or five different formality levels. A bit unrelated if I may: do you know what’s going on with Graham Browne these days? Haven’t been able to get a hold of them on the phone, it seems disconnected. Was there last week. Everything seemed normal. What’s the fabric reference for those fawn trousers? First, Thank you for the passion and hard work that goes into curating and writing this blog. Second, Advise : Suit budget is 500 -2000 gbp. Looking for MTM or Bespoke, would you make some recommendations. Also, Saville row.. where to I start ? Finally, what does your inventory look like ? how many suits, jackets, ties and shoes ? Outfits 1 and 3 are simply superb. I’m on the fence regarding outfit 2, and it could’ve appealed more to me with a roll neck of a different colour. But then that’s just me, and your purpose after all was to showcase the interplay of the blues. Excellent work as always. Outfit 3 is reminiscent of your ensemble for the launch of The Finest Menswear in the World, bar the shirt, tie and shoes. It looked great then, it looks great now. It gives me an idea just how appetising the other shots in the Style Guide are. I have an Arny’s large blue paisley print silk tie bought years ago, which I barely wear. Assuming its casualness, within which kind of outfit would it work best? Their mini counterparts seem easier. Thanks, Simon! It makes sense to me. My complements on your Style Guide, I never much went in for that sort of thing, thinking that style is an innate capacity. Your book was full of great, useful ideas while presenting many time tested standards in men’s clothing. It would be useful for anyone that still cares about dressing in 2017. The New York launch was great fun. I really appreciate you extending your care and love of craft to the printing and construction of the book. As a bookbinder myself, I’m curious about the term “otter binding.” I’m not familiar with that as a structure and couldn’t find any mention online after a quick look. Was this a description from the printer/binder? Simon, since one of your partners for this is Edward Green, I hope you won’t mind me asking this here. In November 2015, you posted an article about EG’s new website. I commented on the post regarding the price rises at the time. I noted that the price of a pair of EG Chelsea shoes (probably their most basic model) had risen to £765 (which seemed a lot at the time). Now the price has risen to £900, less than 18 months later. Some people obviously won’t care about price, but I’m afraid it will be important to many. I really love the look of EG’s shoes, but what has stopped me buying is these persistent increases and the feeling that there is some, let’s say, profit maximisation going on here. Am I wrong? Do you still feel they are good value at £900? Why? Hi Simon – two quick questions – does The Style Guide have much in the way of casual outfits and will the Vietnam era M65 you featured in the Colour Combinations…. article ever make another appearance on PS? Thanks Simon – the wonderful shot of Michael Drake in the French work jacket and olive chinos caught my eye but I wasn’t sure how much other casual stuff was in there. why no turn-ups (cuffs, as we call them in the US) on the royal-blue flannel Anderson & Sheppard? BTW, looks more formal without cuffs. I generally find that the Anderson & Sheppard suits are better without cuffs, as their cut and structure makes them pretty formal. I rarely wear them without a tie for that reason too.